In his seminal text On War, Carl von Clausewitz (1780–1831), a Prussian general and the most influential military theorist of his day, wrote 'War is the prerogative of the sovereign as the duel is the prerogative of the gentleman.' As far as war at sea in the age of sail was concerned, this was particularly apposite since these so-called ‘frigate’ or ‘single ship’ actions were beloved by several generations of artists across a century or more, most notably during the French Revolutionary and Napoleonic Wars (1793–1815). Known to its contemporaries as the ‘Great War’, this prolonged conflict saw many of these two-vessel duels, the majority of which provided numerous painters with rich and – many would argue – even rather glamorous inspiration (see examples by Pocock, Anderson & Condy). One of the most celebrated frigate actions ever fought was between HMS Shannon and the USS Chesapeake during the Anglo-American War of 1812 and an attractive work depicting the victor’s return to Home Waters by Clarkson Stanfield is a highlight of this exhibition. By comparison - and on a far larger scale - are three works by the remarkable French polymath Ambroise Garneray who, following his capture in 1806, spent eight years confined to a Prisoner-of-War hulk in Portsmouth Harbour where he painted a series of views of the moored prison ships which is now seen as the definitive record. 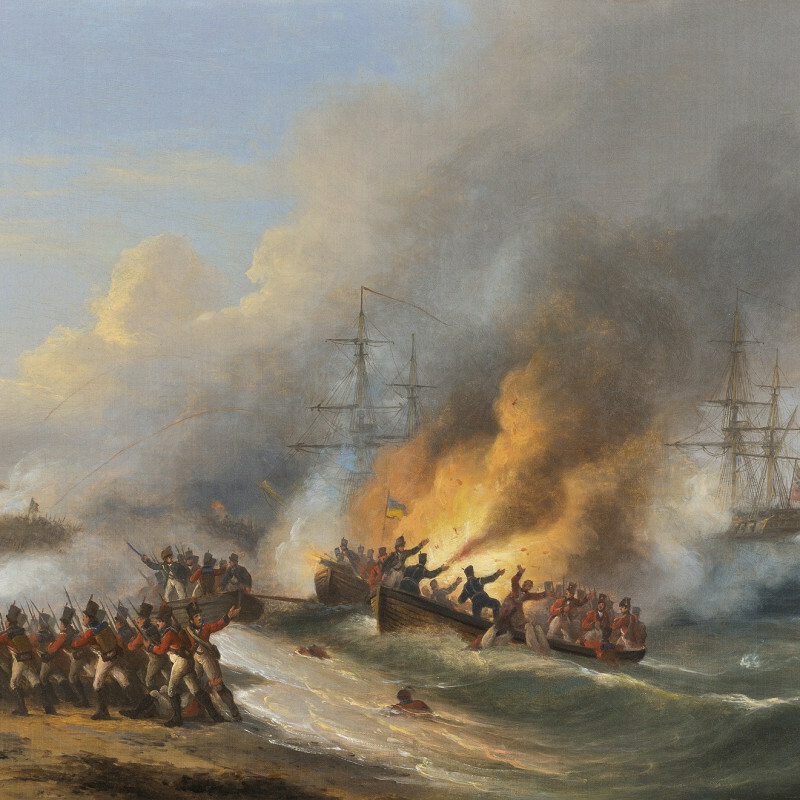 Thomas Luny’s fine atmospheric painting of the amphibious landing in Aboukir Bay in 1801 is a helpful bridge betwixt war at sea and on land, whilst John Atkinson’s spirited view of the King’s Dragoon Guards galloping into action at Waterloo is a useful reminder of the crucial role of the horse in war before the mechanical age, as are Gilbert Holiday’s two scenes of artillery on the Western Front. The outbreak of the second ‘Great War’ in August 1914 saw not only the beginning of a particularly brutal land-based conflict, but also coincided with the dawn of aerial warfare. This exhibition contains works which give a flavour of both arenas by several modern artists, not least the contemporary Gordon Rushmer, whose interpretations of the most recent operations in Iraq and Afghanistan are hauntingly beautiful. Other well-known twentieth century artists featured herein are Paul Maze, Claude Muncaster, Frank Watson Wood, Norman Wilkinson and finally Charles Pears. His superb painting of the Evacuation of St Nazaire and the bombing of the SS Oronsay on 17th June 1940, in fact, encapsulates all three of the principal elements of warfare in that it shows the horrors of a great ocean liner laden with weary and defeated troops recently evacuated from the battlefield whilst under incessant aerial bombardment. Undoubtedly a tour de force by Pears, the work also represents the age-old aspiration of ‘triumph over adversity’, surely the aim of every combatant nation throughout the ages.